These modern-day models draw upon the foundation laid more than 90 years ago by Walter P. Chrysler, who was leading Maxwell Motors in 1924 and released the first automobile to carry the Chrysler name, the Chrysler Six. The car featured a six-cylinder engine and four-wheel hydraulic brakes. This spirit of innovation – and providing a safe vehicle at a fair price – continued after Chrysler founded Chrysler Corporation in 1925. The company soon introduced cars named after their top speed, such as the Chrysler 72 and the high-end Imperial model that competed against Cadillac. In the 1930s as the Great Depression gripped the country, the company remained competitive with affordable cars and technological advancements, including “Floating Power,” which reduced the vibration felt from the engine in the body of the car. Chrysler also introduced the downdraft carburetor, automatic spark control and rustproofed, welded steel bodies. It was also during this decade that the groundbreaking Chrysler Airflow was introduced. The car, which was introduced in 1934, took its design cues from aircraft with aerodynamic features in a teardrop shape. Walter P. Chrysler pictured with a Chrysler Airflow model. While it impressed the engineering community, it wasn’t commercially successful. But the new body construction and engine placement signaled a new age of automobile design. The start of the new decade also marked the end of an era as Walter P. Chrysler died in August 1940. Despite the death of the company founder, Chrysler continued to move forward with innovations, such as the development of a four-speed gearbox with two ranges, the introduction of the Thunderbolt and the Town & Country sedan. When the nation went to war, Chrysler halted civilian production of automobiles in 1942 and retooled. Among the products Chrysler made for the war effort included the M-4 Sherman tank, “Sea Mule” marine tugs and Chrysler-Bell air raid sirens. The end of the war in 1945 allowed Chrysler to resume production of civilian vehicles, and led to the release of new, more powerful engines in the 1950s. In 1951, Chrysler introduced its hemispheric-head V-8 engine – also known as the HEMI, which was initially installed in the Chrysler Saratoga, New Yorker and Imperial. The Chrysler 300 was introduced in 1955 and featured a 300-horsepower HEMI, which not only made it the most powerful full-size car in the world, but also a force to be reckoned with on the NASCAR circuit. The Kiekhaefer Mercury Outboard Racing team won 20 of its 40 NASCAR races. The company’s entire line of cars was honored in 1957 with Motor Trend’s “Car of the Year” award, and that same year, Chrysler introduced the first rear window defogger and child guard rear door locks. This focus on design and safety continued into the 1960s as Chrysler moved to unibody construction, which not only improved fuel economy, but also provided greater protection to passengers in a crash. The company also offered the first five-year, 100,000-mile powertrain warranty. In the 1970s, Chrysler began to offer smaller vehicles in response to fuel shortages and oil embargoes. While the company pivoted on the size of cars, it continued to offer new features, including electronic ignition. The decade also saw the introduction of actor Ricardo Montalban as the pitchman for the Chrysler Cordoba in 1975, and three years later, Lee Iacocca was named president of Chrysler Corporation. With the arrival of the 1980s, the company was dealing with a financial crisis, which led to a new generation of vehicles for the company. The Aries and Reliant K-cars were introduced in 1982 along with the front-wheel-drive Chrysler LeBaron. Then, in 1984, a whole new segment was introduced into the automotive industry with the minivan. The front-wheel-drive, compact van created a new segment in the automotive market and became an industry standard in the decades following its release. The 1990s brought the debut of new sedans, minivan enhancements and the return of a familiar nameplate. The Concorde sedan debuted in 1993 and featured a new “cab forward” design, which created more interior cabin room for passengers. Two years later, Chrysler introduced the mid-size Chrysler Cirrus, which also featured the “cab forward” design. As the decade came to end, Chrysler merged with Daimler and launched a number of new vehicles in the start of the new millennium. The fourth-generation minivan was introduced with new features, such as a power liftgate. In 2001, the PT Cruiser debuted and was named Motor Trend’s “Car of the Year.” The Chrysler Pacifica was introduced in 2004 and was predecessor to today’s popular crossover segment. 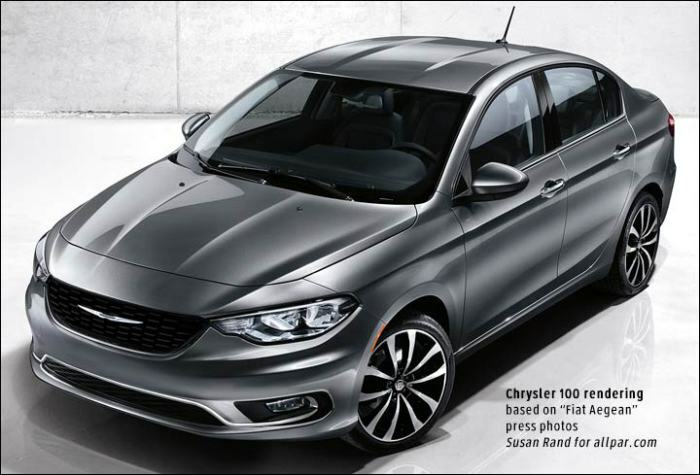 After undergoing bankruptcy, and becoming part of FIAT, the company introduced the new Chrysler 200 mid-size sedan in 2014, which included a number of affordable luxury features, such as lane departure warning, heated steering wheel and an all-wheel-drive system. Ninety years ago, Chrysler founded what was known as “Detroit’s engineering company,” according to Rosenbusch, and that founding principle has remained in the company’s DNA with powerful engines, the latest in passenger safety technology and even creating a new segment – the minivan. “(Chrysler) engineers have continued to develop and bring innovations into the Chrysler brand and models,” Rosenbusch said. Stay tuned to see what Chrysler brand has to offer over the next 90 years. Susan Rand has provided a quick rendering of the Chrysler 100, based on the Fiat Aegean concept, and assuming very few exterior changes for North America. It has the current “wheel-well” sidelights, which conform to both American and European standards, and while it uses a Chrysler grille, keeps the indentations of the Fiat concept. The Chrysler 100 is reportedly to be based on SUSW, a new American version of the old Fiat-GM SCSS platform. It will likely have all American engines, perhaps limited to the 2.0 turbo and 2.0 non-turbo, though a 1.4 Fiat turbo might be used to get high fuel mileage in the ads. European versions are to get engines ranging from 95 to 120 horsepower, including diesels. Allpar expects the car to have the first nine-speed automatic transmission in its class, with better acceleration and economy than the current Dodge Dart, which will also end up with a nine-speed. There may be no greater joy in life than knowing a newborn is on the way. Soon, you’ll get to experience all the excitement and bliss that being a parent brings. But with this wonder comes great responsibility. The entire well-being of another human will rest in your hands. It’s time to evaluate some things in your life and make a few changes. Remember that car you bought fresh out of school that was some combination of being affordable, cool, unique and youthful? Now it’s deteriorating into a pile of scap metal in your driveway. You gamble with whether you will or will not make it to your destination or not on every trip you take. Getting stranded on the side of the freeway is one thing, but having it happen with an infant aboard will be a nightmare. Looks like it’s time for an upgrade. So what should a new parent look for in an automobile? Well a lot of things, really. But to help any soon-to-be progenitors, we have broken down the new car checklist into three key areas. First, there are those things that need to be in a vehicle to make transporting a baby safe and easy. Second are things that aren’t quite a necessity, but would make your time behind the wheel as a parent a lot less stressful. Third, there are the items that are icing on the cake; the added perks that parents might not need, but will gladly take if offered. The most important thing you can do as a parent is keep your child safe. This is especially true when it comes to cars and driving. Regardless of how skilled you are behind the wheel, there is always the unknown factor of weather, road conditions and other motorists that could result in a crash. Modern vehicles have jumped leaps and bounds in terms of crash worthiness compared to older cars, even within the past five years. A modern car will keep its occupants much safer than models from the past. But some are still safer than others. To check and compare how well prospective new vehicle purchases rate in crash testing, visit the Insurance Institute of Highway Safety database or the one offered by the National Highway Traffic Safety Act. A newborn is going to spend the next several years in child safety seats, so a vehicle with a rear seat is essential. Although most four- and five-person coupes do come equipped with child seat anchors, accessing them and the child can be a nightmare because there isn’t a door opening directly beside the rear seat. When your child is an infant and in a rear facing child seat this can be quite the struggle. It’s best to look for a four-door vehicle because the easier accessed rear seat area will be easier to deal with. If your rear facing child seat has already been purchased, take it along when new car shopping so it can be test fitted to the backseat area. Pay attention to a vehicle’s official rear legroom measurement as these safety seats are deceivingly long. Not all smaller cars can accommodate one without forcing the front passenger seat to be placed uncomfortably close to the windshield. Rear doors are also important when it comes to size and operation. Vehicles like a Range Rover L with the extended wheelbase give parents all the space in the world to secure their bundles of joy to the back seats, but the rear doors also require all the space in the world to open, which is a challenge in parking lots. When looking at new cars, see how far out the doors open in relation to the access they give to the backseat area. As well, the angle in which they swing open is important as the closer to 90 degrees the better. Still, there is one champion when it comes to rear vehicle doors for parents: the sliding door. Not only does it give them full access to their kids, but it also takes up minimal space when opened. With the essentials taken care of, many other automotive features can help ease the transition into parenthood. Chances are you’ll become more distracted behind the wheel now that an extra, highly demanding passenger is frequently aboard. Vehicles with the latest active safety systems like lane departure warning, blind spot monitoring and collision detection could be a life saver if you stop paying attention, even for a split second. will further help a new parent whose hands will inevitably be full each time they approach the vehicle. And when it comes to loading a child and their gear into a car, a vehicle’s height is important. Crossovers continue to gain popularity with new parents due partially to their load height. SUVs usually sit too high, requiring some people to have to step up into the vehicle to secure their child in a safety seat. What-to-Look-for-in-a-Car-with-a-Baby-on-the-Way-07.jpgRegular cars, on the other hand, sit too low and force parents to hunch over in backbreaking slouches as they secure the safety belts. While discussing access, safety anchors that are easy to reach for the child seats are a huge plus. Some vehicles require a lot of work to uncover and use these clips. While you’re at it, try folding the rear seats down to see how easy it is to do when children are not occupying them for added utility. Finally, keeping the sun out of your child’s eyes is important, especially ones too small to relate any discomfort to you. A vehicle with factory or dealer installed rear window tint is good, but one with built in roll-up sunshades is better. This isn’t as unusual as it once was either as several minivans, crossovers and sedans are now offering this feature. Of course, there are some other items that will make life even easier on new parents, like extra cup holders for kid’s snacks and food as well as excess storage bins for other random items. Some vehicles now include a secondary wraparound rear view mirror so a driver can take a quick look back on their kids without having to turn all the way around or moving the regular rear view mirror down. Removable rear headrests are a nice bonus as they make installing child safety seats much easier and built-in rear video screens can help entertain little ones on longer trips. Ultimately though, it all comes down to what is most important to you and what you can afford. There are many choices out there that are great, child friendly vehicles. As long as all the Must Haves are checked off as well as a good portion of the Nice to Haves, you should be fine. Happy shopping and good luck with the new baby! three percent, compared with the conventional vehicle-engine pairings. account for an estimated C02 emissions-reduction of up to three percent. quarter. ESS arrives the following quarter in the all-new Chrysler 200.
deactivated with the push of a button, and then reactivated. Efficiency and refinement are hallmarks of the Tigershark and Pentastar engine families. ESS just complements these attributes. design feature reduces weight and affords packaging benefits. are smaller than those of other transmissions.